This is a really exciting episode of The Football Coaching Podcast for me. We’re talking Coaching Character in our young men this week with Bob Lord. 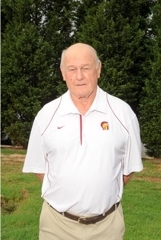 Coach Lord has over 50 years of experience in coaching football, and certainly knows a thing or two about the role of coaches in developing men of great character. Coach Lord’s career is has included NFL, College and High School experience. He has coached everywhere, including: the Packers, Bears and Giants in the NFL; Valdosta State, Morehead State and Liberty University; NFL Europe; and many years coaching High School in Georgia. This interview is particularly special for me, because one of those High School stops was as the Head Football Coach at Pope High School in Marietta, GA – where I had the pleasure of playing for Coach Lord. Currently, he is coaching Special Teams at Lassiter High School in Marietta. I hope you will enjoy this interview. We can never forget what it really means to call ourselves a coach!